Physocarpus opulifolius 'Tuilad' known by its marketing name Physocarpus opulifolius Lady in Red is sometimes referred to as Physocarpus opulifolius Ruby Spice. It is a medium-sized deciduous shrub with large, attractively lobed, red or reddish-purple leaves. 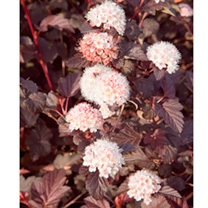 In summer, it produces dense round flower heads of tiny pink flowers which look gorgeous against the dark foliage. It prefers a moist, well drained soil in sun or partial shade. RHS Award of Garden Merit winner. Flowering time: June-July. Height 1-1.5m (3'3"-5'); spread 1.5m (5'). Supplied in a 2 litre pot.